Since 1982, the Chicago Blaze has been playing competitive Rugby in the Chicagoland area and throughout the United States. 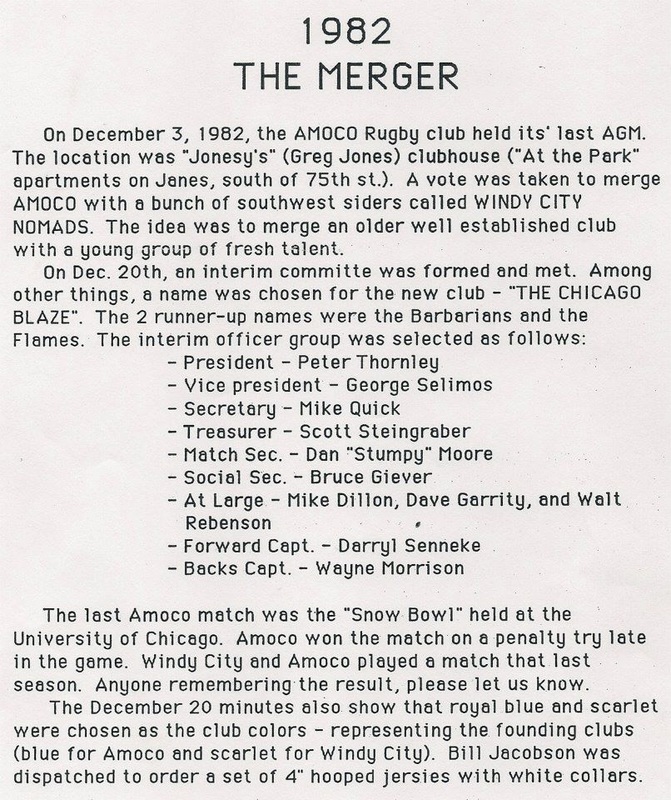 The Chicago Blaze was formed in 1982 by merging the Windy City Nomads with the Amoco Rugby Club. The merger was consummated after a couple of beers and meetings in the basement of Pete Thornley house. The key to success was to form an entirely new club. The Blaze retained the colors Blue for Amoco and Red for Nomads. The first Blaze jerseys had the red and blue hoops. Peter Thornley, one of the founding members, was instrumental to The Blazes future by transforming an idea into reality, making the Blaze the first Rugby club in the United States of America to have a Rugby Facility. Before this transformation the Blaze played on the forest preserve fields at 75th St and Rt 53 in Naperville for a few years, but were constantly harassed by rangers, getting fined for having cans of beer on the sideline and things of that nature. That led to the purchase, by Pete Thornley, of the 9 acre farm on Smith Rd in 1984 for $89,000, but it was six years before the opening match in 1990. In the meantime we played near Midway airport at a school on Narragansett. Today the Blaze own 15 acres of land that supports three fields, with the main pitch having lights, locker room facilities, with showers, and a clubhouse with a bar for post-match socials, parties and events. Development continues with a play area for kids, spectator stands, horseshoe pit, and an ever-improving Rugby facility. The Blaze have traveled abroad on several international tours to England (1989), Ireland (1994), Spain (1999) and New Zealand (2002). Over the past years, the Blaze have won many Midwest Championships at Division 1 and 2 levels. The Blaze has competed in the National Championships in 1986, 1990, 1996, 2007, 2009, 2010, and 2011. Today the club is working towards National Division 2 Championships.